With spring in full swing and summer almost upon us, there is so much color inspiration that I’m finding I can’t change my nail color fast enough! One day I’m in love with a beautiful pastel mint, and the next, bright, bold blues and reds are my obsession! Today, I am so excited to showcase my favorite spring and summer colors that will help you transition effortlessly through the seasons! It’s hard for me to describe in words how much I adore this color. 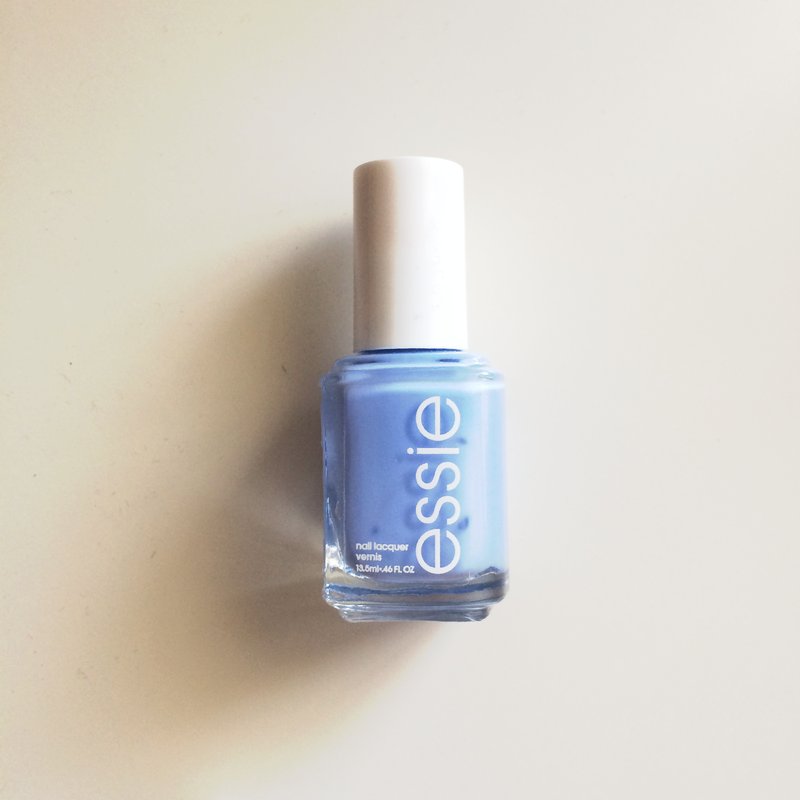 Bikini So Teeny is being celebrated as Essie‘s Polish of the Month for May, and it’s no wonder why. May is a little springy and a bit summery, which makes this shimmering periwinkle perfect for both seasons. Paired with a floppy sun hat and light sundress, this color will pull your entire spring and summer wardrobe together without a problem. Inspiration for April Showers and May Flowers. We’ve said goodbye to the harsh winter weather, and hello to pretty flowers and warm evenings. While you don’t have to completely stash your winter hues, its fun to break out the brighter colors that were in hibernation for the early part of 2014! Let’s be real here. Who doesn’t love the mint fashion trend that has taken over these past couple years. 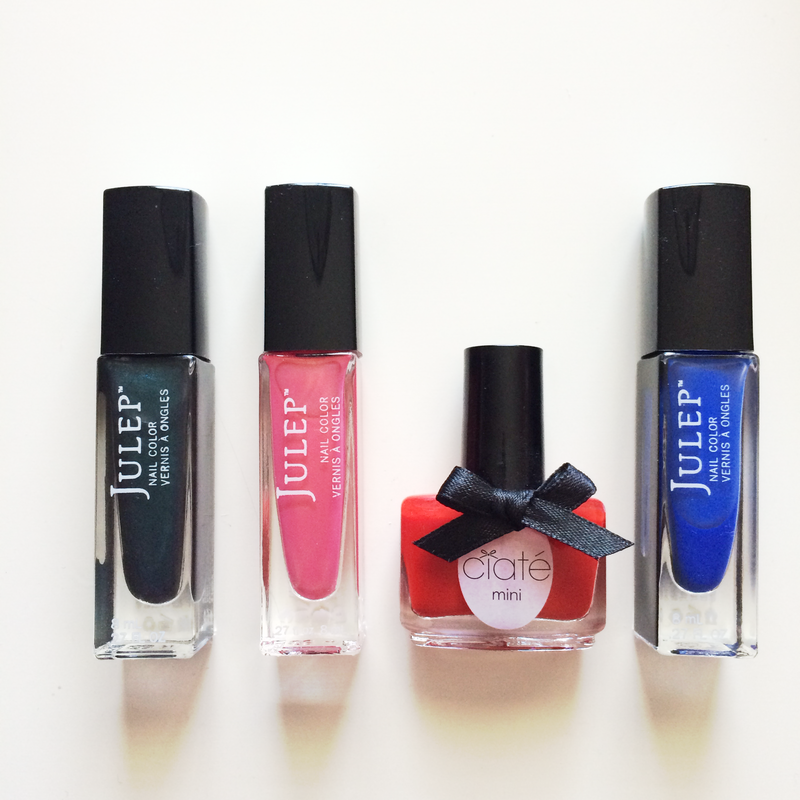 Julep‘s Shenae definitely doesn’t miss the mark on this well-loved trend. Replace your neutrals and blush pinks with this beauty, and the compliments aren’t far behind! What goes hand and hand with mint? Coral, of course, just like Ciate‘s Speed Dial! It’s a color that compliments almost every skin tone, and combines flirty orange and pink without being too bright. 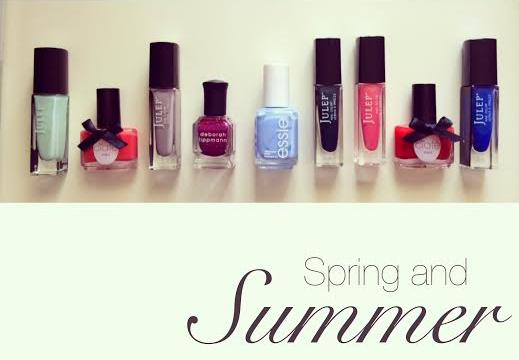 Alaina is such a versatile polish for spring because it lets your pretty clothes and accessories take center stage. Grey polishes are such a chic approach to spring trends! The automatic thought about spring nail color is that it has to be pastel and Easter-y. Not true! This gorg Deborah Lippmann aptly named Raspberry Beret, is beautiful this time of year. The subtle berry is still bright enough to rock during spring, and I’m a sucker for any polish with holographic glitter. Inspiration for beach days and summer nights. Summer is such a fun time to let your metaphorical nail polish hair down and rock colors you feel are too bold for winter and spring! That’s why this summer you’ll see women rocking anything from neon blues and pinks to classic reds, and everything in between. One of the prettiest trends I see coming this summer are mermaid-inspired gem tones! Julep’s Angela is a shimmering green/blue with hints of purple, making it a truly dynamic shade for summer. While pretty pale pinks are fun all year round, Julep’s Laree puts a summery twist on the classic spring color. Ramp up the bold tones and add a hint of gold shimmer, and here you have a fun lacquer you’ll obsess over! Classic reds, like Ciate’s Mistress, are timeless. They’re perfect for fun in the sun, and will definitely reflect the triple digit temps found during these hot summer months! It’s no surprise to find Bailey, a neon royal blue, on my fav summer list. One thing to keep in mind when it comes to neon colors that might go on streaky or not fully opaque is to paint a base coat of white to brighten up the color! It’s one of my favorite tricks, and really makes all the difference. What colors make your heart flutter during spring and summer? Happy reading!